"Lord Caitanya's movement of Krsna consciousness is full of dancing and singing about the pastimes of Lord Krsna. It is compared herein to the pure waters of the Ganges, which are full of lotus flowers. The enjoyers of these lotus flowers are the pure devotees, who are like bees and swans. They chant like the flowing of the Ganges, the river of the celestial kingdom. The author desires such sweet flowing waves to cover his tongue. He humbly compares himself to materialistic persons who always engage in dry talk from which they derive no satisfaction. 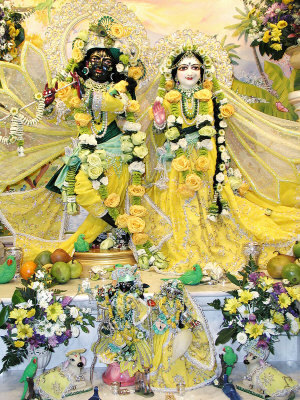 If they were to use their dry tongues to chant the holy name of the Lord -- Hare Krsna, Hare Krsna, Krsna Krsna, Hare Hare / Hare Rama, Hare Rama, Rama Rama, Hare Hare -- as exemplified by Lord Caitanya, they would taste sweet nectar and enjoy life." *Special thanks to Mallika dasi for her beautiful Deity photos from New Raman Reti Dhama.